so glad there’s something i can eat there now!!! Scott, I also had the Gardein Orange Peel Chicken and thought it was really good. I’m so glad to have that option now at Yard House since it’s such a good place to meet omni friends. 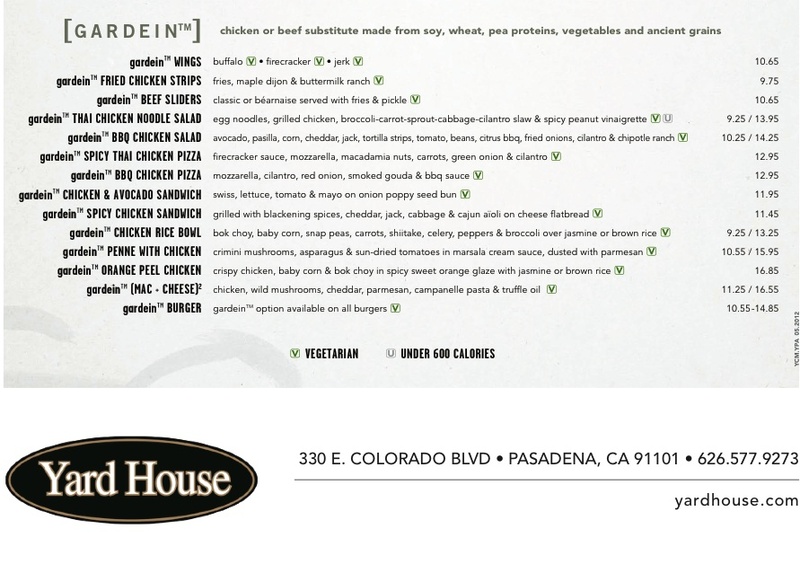 I don’t know why they told you that’s the only one they could do vegan — a friend of mine got an e-mail from Yard House that explicitly said that the Gardein Chicken Rice Bowl is also vegan as plated. Do you know if the tofu/mushrooms lettuce wraps are vegan? Thanks!!! My understanding is that only the six items I mentioned in the post are vegan as plated. Not sure what makes the lettuce wraps unvegan but it might have something to do with the three dipping sauces they come with. Perhaps substitutions can be made — the following sauces are vegan at Yard House: Apple Plum Ginger, Soy Vinaigrette, Lemon Vinaigrette, Balsamic Vinaigrette, Spiced Balsamic Vinaigrette, Cattleman’s BBQ, Citrus BBQ & Pico de Gallo. Hope this helps! From what I am aware of, foe the lettuce wraps the oyster sauce used on the tofu and mushrooms are not vegan. You can order it without, but some locations will give you a hard time. I’m not sure about the sauces. What about the tofu mushroom wraps?